U.S. Missing the 2010 World Expo? The Wahee Cyclone Gets Support! Aerial Antics: Let's Go To Tokyo! Wild Adventures Theme Park has announced a special bonus for ACE members that will take place each operating of the park's 2009 season. Valid members of American Coaster Enthusiasts (ACE) have the opportunity to be on the first ride of the day on the Cheetah rollercoaster at Wild Adventures Theme and Water Park. This will only be available to ACE members daily during the regular park season. That's very nice of the park! I just noticed that Six Flags now has an entire section of their website devoted to the Six Flags Media Networks that they have been making millions off of. The site touts Six Flags' ability to provide advertisers with a wide variety of ways to get their message across to visitors of the parks. Everything from print ads on maps, to commercials while people are in line, Six Flags is willing to sell it to you. While I can't say I personally think that these mass advertising initiatives are adding anything to the Six Flags experience, I will say that it's quite smart of the company to be pushing it. In these times grabbing and extra $60 million or whatever the exact figure is per year isn't a bad thing! 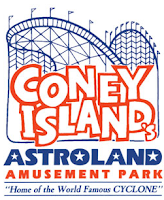 New York city officials have announced that the famous Astroland Rocket will be saved and be incorporated into the redevelopment of Coney Island. "The 71 foot-long, 14,000 pound Rocket was removed from its perch atop Gregory and Paul’s boardwalk stand in anticipation of its move to Homeport in Staten Island, a City-owned facility operated by NYCEDC. The Rocket will become a permanent and iconic part of the 27 acre redeveloped amusement district in Coney Island. " Carol Hill Albert and Jerry Albert, whose family owned Astroland, donated the famous Rocket to the city for use in the redevelopment. "The Rocket was the first ride debuted at Astroland Park when it opened in 1962 and one of the first space voyage simulators created during the Space Race. Originally built as the "Star Flyer," it was renamed the Astroland Rocket in 1963 and continued to operate through the 1970’s. 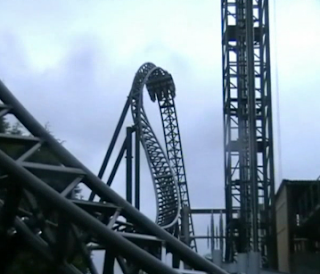 The ride had 26 seats and lifted on hydraulics to simulate launching into space. " It's wonderful that the city is trying to preserve some history as part of their plans for Coney Island. The Tokyo Disneyland Resort now has wonderful birds eye views up, and there's tons to see. Let's take a little tour, shall we? Let's start outside the main gates and look at the new Tokyo Disneyland Hotel. The hotel opened in July of 2008 and looks beautiful. It's now the 4th Disneyland Hotel, obviously the first was in California, second Paris, and then Hong Kong. One other stop (for Jeff) before the parks, the new Cirque Du Soleil theater featuring the resident show ZED. The theater looks somewhat like a tooth to me, but it's fairly awesome that they built a resident show at Tokyo Disneyland Resort. Just inside the entrance to Tomorrowland you'll find the newest attraction at Tokyo Disneyland, Monsters Inc. Ride and Go Seek. The dark ride has a rather impressive building that looks just like the scream factory from the film. It opens this spring. 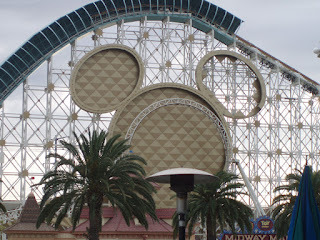 Like Disneyland in California, Tokyo Disneyland has a Toontown section of the park. Basically a mirror image copy of the section in California, the area in home to the Roger Rabbit Cartoon Spin dark ride as well. Here's the park Haunted Mansion and Splash Mountain attractions. They are quite squished together! I still have a hard time placing the park's Haunted Mansion in the Fantasyland section of the park, but it is so I'll deal with it. Also in this photo you can see the park's parade just about ready to go on stage in between the Haunted Mansion building and Splash Mountain. Cool! Let's head next door to DisneySea. The resort's 2nd gate opened in September of 2001 and has been wowing visitors since. I can only wish that I could say I've been one of those visitors. Above we see Mt. Prometheus and the Mysterious Island section of the park. Here we have the beautiful Tower of Terror on the left in the American Waterfront section of the park. I believe that the large ship, the S.S. Columbia, will be the home of the park's upcoming version of Turtle Talk with Crush. To wrap things up we have a view of the Indiana Jones Adventure: Temple of the Crystal Skull building and the Raging Spirits roller coaster in the Lost River Delta section. If you would like to go sightseeing on your own, follow this link! After finding myself in a quandary and doing a bit of research, I think a better title for this week's SBS would have been "Name That Park". Why? Because back in 1998, this park apparently used three different names! Follow along and you'll see what I mean. Our identity crisis begins with the brochure cover, which would have us believe that this park's proper title is "SeaWorld Adventure Park". (It just happens to be located in San Antonio.) This is partially accurate. 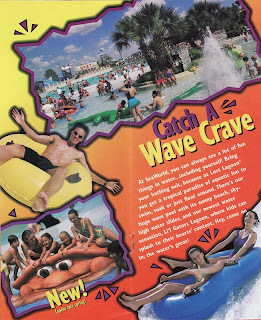 In 1998, Busch Entertainment decided to add the tag line "Adventure Park" to the titles of all its SeaWorld properties. 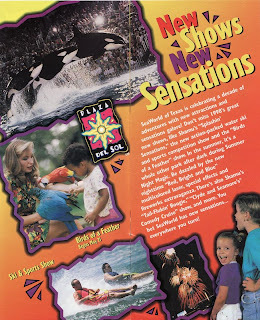 The logo which appears at the top of this brochure was also introduced as part of the change, and it's worth noting that this marked the fourth logo change in SeaWorld's history. Now we come to the fine print, and lo and behold the park is suddenly called "SeaWorld of Texas"! How did that happen? This is where the details get a bit hairy. "SeaWorld of Texas" was actually this park's original name. 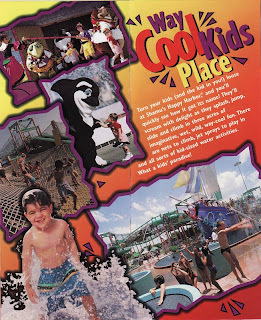 At some point in time which defies all documentation but appears to have preceded the "Adventure Park" addition, the park's name was changed to "SeaWorld San Antonio". So... 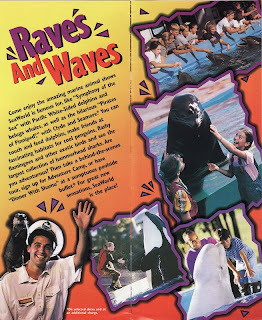 In 1998, was the park's full title actually "SeaWorld Adventure Park San Antonio"?? You be the judge. My head was starting to hurt, so I stopped thinking about it! Alright, enough with the names. Let's focus on the meat of this brochure, shall we? SeaWorld San Antonio celebrated its tenth anniversary in 1998, and it did so in style. A host of new shows were introduced to complement the park's existing line-up. Remember when Great White did NOT have a clone right down the road? Well take heart, SeaWorld San Antonio: Yours was first, and it still has a much more original name! 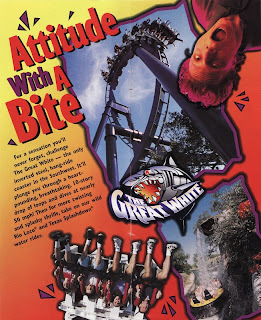 Actually, Great White is a perfect example of why Busch Entertainment felt the need (however briefly) to introduce the "Adventure Parks" bit. After purchasing the SeaWorld parks, Anheuser-Busch put a great deal of money and effort into diversifying the parks' attractions and rebranding them as full-fledged theme parks as opposed to just marine life centers. When Anheuser-Busch began to transform SeaWorld San Antonio into the vacation destination it is today, they didn't limit themselves to thrill rides. In fact, Lost Lagoon--which opened in 1993--preceded all of the park's roller coasters. After spending a day watching the animals and trainers play in the water, I guess many guests get a hankering to engage in some water play of their own! Who needs a baby-sitter when a friendly killer whale is just dying to play with your children?? Okay, this one really IS friendly...I promise! Seriously though, what a great children's area. I totally want to play with Shamu! "Adventure Park" or not, marine animals are still the bread and butter of SeaWorld San Antonio. It just wouldn't be SeaWorld without all the great animal attractions and shows! And finally, we take a gander at the operating schedule for SeaWorld of Texas--er, SeaWorld San Antonio...Adventure Park? Oh never mind... What's in a name anyway? The point is, this park has something for everybody! If all goes well, I just may be paying them a visit this year myself. There's only three more days to vote in January's NewsPlusNotes poll, which asks what is the biggest recent amusement park loss. Many have voted, make sure you get your opinion in, too. 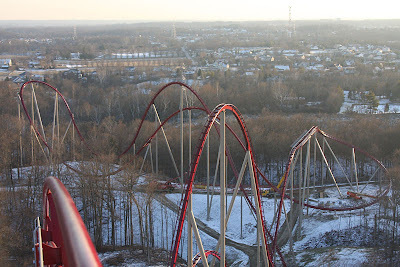 KIExtreme has a new gallery up of some aerial photos of Diamondback at Kings Island that were taken just a couple hours after the ride's track was completed. Plus the park is covered in snow making for some pretty shots! Our friends over at ValleyfairZone wanted us to let everyone know that they have launched an all new version of the web's only Valleyfair fansite. To kick things off the site has also posted some winter photos of the park, including some bits of the park's new wave pool under construction. No not possessed by something, that's it's new name. The park's official website has been updated to reflect this change. The park writes, "The opening season rituals now complete and smoke cleared (think dramatic) the coaster that was formerly known as Voodoo is now truly Possessed. Possessed will now open for the 2009 operating season to provide more thrilling rides and produce more jaw dropping screams than ever before." If you ever visit a novelty shop in the state of Pennsylvania, you may encounter a line of T-shirts claiming that our residents enjoy four seasons: "Almost Winter, Winter, Still Winter, and Construction". There may be more than a grain of truth to this longstanding joke, but fortunately our friends at Lakemont Park in Altoona stand to benefit from it! Lakemont's annual "Holiday Lights on the Lake" event wrapped up just a few short weeks ago, and the park was pleased to inform us that 2008 marked the most successful year in the event's 12-year history. Holiday Lights on the Lake--a drive-through attraction featuring fifty-one acres of twinkling lights and animated displays--has become a central PA tradition, and boy does it draw the crowds! More than 26,000 vehicles visited Lakemont between Thanksgiving and New Year's to enjoy this spectacle, which was made possible through the support of 135 corporate sponsors. But wait... Did somebody say "construction"? 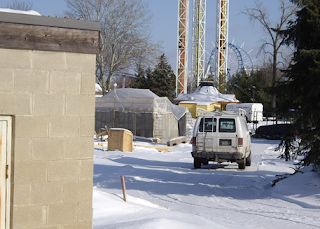 No, Lakemont Park is not erecting a hypercoaster, or any other type of coaster for that matter! It will, however, be a beneficiary of an ongoing, multi-year construction project aimed at widening the road which runs parallel to the park, appropriately named "Park Avenue". This massive effort, scheduled to be completed by 2010, will transform the existing two-lane road into a five-lane road and will certainly alleviate some traffic congestion in the area. All of the homes which formerly sat across Park Avenue from Lakemont have been purchased and demolished in order to make way for the widened thoroughfare. 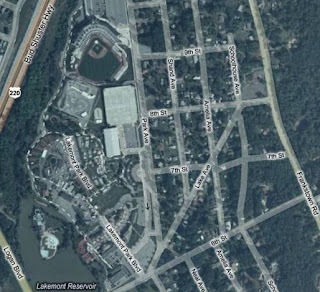 Below is an aerial view of Lakemont and the surrounding area [apparently Mike's Live Local obsession is contagious!] that shows the location of the road which has gone under the knife. Park Avenue runs right down the middle, while Lakemont Park and Blair County Ballpark (home of the Altoona Curve minor league baseball team) sit to the left. Amusement Today has exclusively revealed that Knoebels Amusement Resort has indeed purchased the track and trains from The Golden Nugget, soon to be removed from Morey's Piers in Wildwood, NJ. Great news! The ride couldn't be in more capable, caring hands. 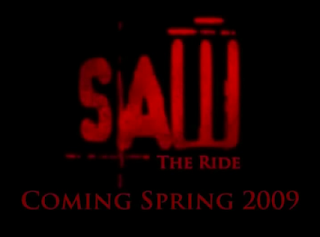 The article does say that resurrecting the ride is at the earliest a 2010 project, so who knows when it'll open. It's exciting either way! 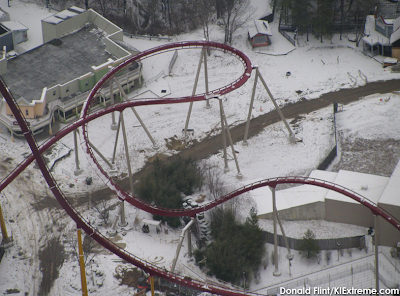 KINGS ISLAND, Ohio – Workmen finished installing track on the new Diamondback roller coaster at Kings Island on Monday. 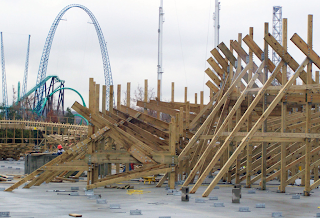 Track piece number 129 was the final piece of track installed on the 5,282 foot-long $22 million steel coaster. Diamondback stands 230 feet at its highest point with a first drop of 215 feet at a 74-degree angle. The ride features 10 vertical drops overall, including drops of 193, 131, 129, 110 and 106 feet; two helixes and a splashdown ending. Riders will travel at speeds in excess of 80 miles per hour. Designed by Bolliger and Mabillard of Monthey, Switzerland, Diamondback is the tallest, fastest and meanest roller coaster to ever strike Kings Island. Diamondback opens to the public April 18. It's been a while since I've really checked out a lot of Manta at Sea World Orlando updates since the main track construction was completed. That doesn't mean crews haven't been hard at work on the ride, and the latest update from RollerCoasterPro proves this point. The station, maintenance, and transfer buildings are all making nice progress, along with the ride's landscaping and water features. There's lots of details to see, so why not go check out RollerCoasterPro's update? Let's start with Six Flags Magic Mountain, who is just flying along with the construction of Terminator Salvation. Tons of bents are already up, and the GCI Intern website has some very recent photos posted! Check them out here. Wild Adventures has released details of some exciting promotions that recently took place at the theme park. Linda Jensen has recently been appointed to the position of Vice President of Marketing and Sales and Steve Cruz has been named Director of sales. Both have long histories of success in the industry and we congratulate them both! TGESource has some video of the Magic Kingdom's newest parade, titled Celebrate A Dream Come True. Tied into Disney Park's latest marketing campaign asking guests what they will celebrate, the parade is very upbeat and features a lot of dance performances. Click here to see the video from TGESource. Carowinds has published some photos of the new Vekoma trains that have been built for the Carolina Cobra. These new style trains feature modern restraints that hopefully will provide a more enjoyable ride for passengers. Here's the photos. Don't forget that if you are able to go, Morey's Piers will have a ceremony for the Golden Nugget ride on January 31st at noon. Anyone is welcome according to the park and attendees will receive a special commemorative souvenir. It's so wonderful the park is doing this for the ride! Legoland California has been granted preliminary approval to build a 250 room, Lego themed hotel outside the theme park's gates. The property already opened the Sea Life Park aquarium this past summer and is now seeking to keep guests on property even longer as a vacation destination. Always positive to hear a park expanding, even if just a hotel, in these times! 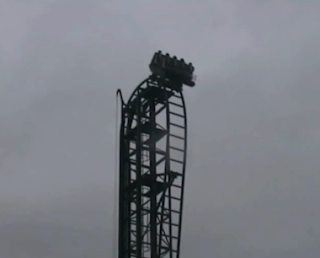 Thorpe Park Mania has some exclusive footage of Saw: The Ride at Thorpe Park testing. You can get to the video by following this link. The ride really keeps a very quick pace after completing the first drop. You can also see in the video the massive saw blades that await riders at the bottom of that drop! Looks like a fun ride, and the first, indoor, section continues to be a mystery for now. 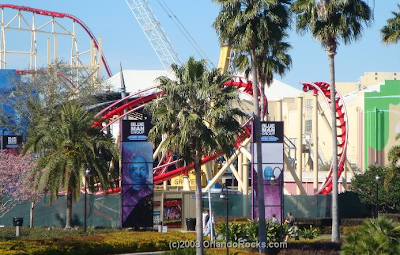 Rockit at Universal Studios Florida has been making quick progress again this week, as a great portion of the later half of the ride is now complete. Seen above, the helix that extends out toward the CityWalk section of the Resort Property has been completed and looks pretty wild. This will really liven up the area! Head over to OrlandoRocks to see all the progress. Wildfire is a B&M that a lot of people have been on, being located at the popular Silver Dollar City theme park in Branson, Missouri, but is not often talked about. The ride is just over 3,000 ft. long and has a substantial 155 ft. first drop with five inversions after that. I was playing around with Live Local once more, and tracked down some bird's eye views of PortAventura in Spain. The park is home to some interesting coasters, and some very high level theming due to it's former relationship with Universal. The park opened in 1995 as a joint venture between Tussands Group, Busch Entertainment, and Universal. Universal soon bought most of the ownership of the property, added a waterpark and several hotels, and then eventually sold all their ownership of the property. Here's the very impressive looking Dragon Khan. The B&M monster sit-down coaster features over 4,000 ft of track an a 160+ ft first drop. Above the wooden coasters Stampida, which were built by Custom Coasters in 1997 and features a near head on collision. Intertwined with Stampida is Tomahawk, a small family wooden coaster opened at the same time as well. I love mine trains, that's no secret. Above we have Diablo, one of the later, (technically 2nd latest, Road Runner Express at Six Flags Fiesta Texas was the last one) mine trains designed by Arrow Dynamics. The ride has three lifts like a good mine train should, and features a wooden structure. There's lots more to see, but I'll let you see the sights on your own. Use this link to get to the images, and then move to the right a bit to start with the park. What this means is you can bet on them cutting the distribution severely in order to manage their debt in order to survive. That Paramount purchase really did them in, though I doubt anyone in the company would admit it. Watch for the stock price to dip even further on this news. 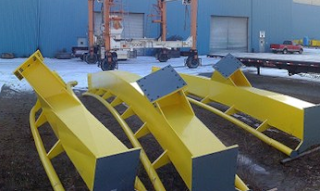 Looks like there's some new B&M track - painted a vibrant yellow - laying outside the fabrication plant (that NewsPlusNotes gave you an exclusive tour of) in Ohio. What's this for? Well for now it's a mystery! A project in North America, or for somewhere else in the world - we're not sure at this point! Check out this thread on KIExtreme for more. The next phase of heavy work has started in the Paradise Pier section of Disney's California Adventure, turning the area into quite the construction zone as the $1.1 Billion makeover of the theme park rages on. On the Theme Park Reivew boards user ECZenith has posted some wonderful photos of the work currently going on. The iconic Mickey Mouse head on the California Screamin' roller coaster has started to come down, the Sun Wheel is heavy into its conversion into Mickey's Fun Wheel, and the lagoon is drained and torn apart for the World of Color Show to be installed. Check out all the photos and updates! 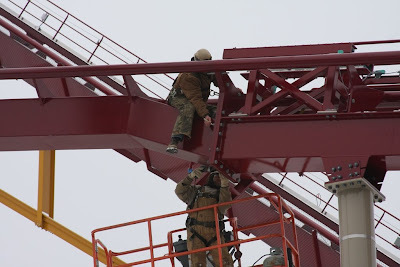 It appears as though Diamondback at Kings Island is nearing completion according to a large new batch of photos posted on the official site for the ride. Some of the photos, like above, were taken from the top of the lift hill and provide some excellent views of the ride! 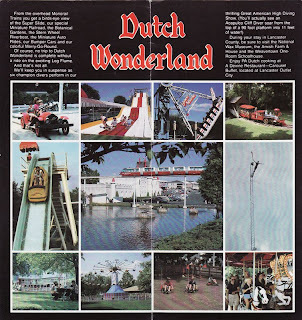 Sabrina's Brochure Spotlight: Dutch Wonderland 198? It was bound to happen sooner or later. We've come to one of the brochures in my collection which is totally, completely and utterly devoid of any date information! I can tell you with certainty that it hails from the mid- to late '80s. Beyond that, your guess is as good as mine. If anybody can help me solve this mystery, I'm all ears! The castle on the cover of this brochure says it all: Dutch Wonderland is a place for kids! But unlike many of the other children's parks which began popping up all over this country in the '50s and '60s, Dutch Wonderland has always put an emphasis on rides in addition to themed areas and entertainment. Most of the rides featured in this photo collage can still be enjoyed at Dutch Wonderland today. A few of them--the antique cars, train, and riverboat--actually opened with the park back in 1963. The Great American High Diving Show as well as the Merry-Go-Round debuted at the park in 1982, so we can assume that the brochure isn't any older than that! 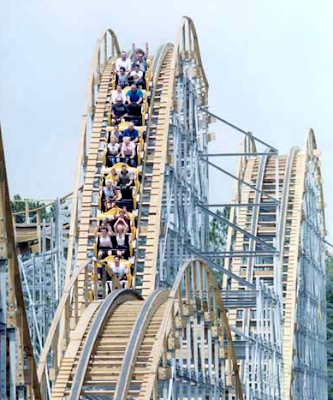 If you've ever traveled through Lancaster, Pennsylvania, odds are you've driven right past Dutch Wonderland. The park's unlikely location along one of the major roads makes it nearly impossible to miss. 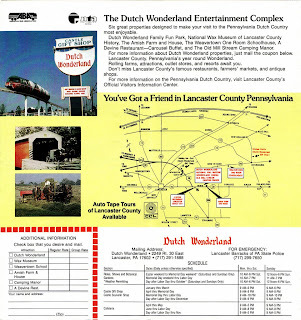 It also makes it super convenient to check out these other great attractions in Pennsylvania Dutch Country, all of which were apparently owned by or affiliated with Dutch Wonderland at the time. Many people don't realize it, but Lancaster County truly is a tourist destination in this state. 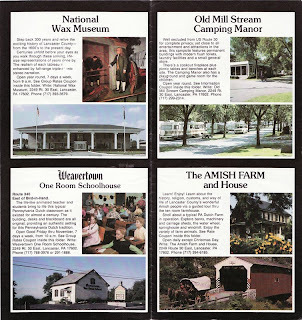 Possibly the only clue to this brochure's date is the sign advertising an appearance by "Suzanne Marie" in the upper left-hand photo. Unfortunately, that did not get me very far either! On a more humorous note, I wonder why they felt the need to include the phone number of the local state police barracks in this brochure?! Somehow I don't expect to see roving gangs of Amish hoodlums harrassing park guests!